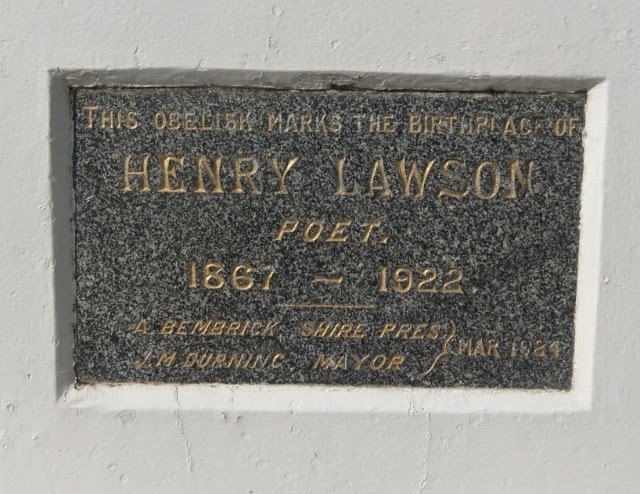 This is the actual spot - he was born in a tent in the goldfields. We later went into town to get our food for the day and I came out of the IGA and Neil is chatting to a town reporter for the Grenfell Record and she is busy writing notes and when I turn up she takes photos etc. It is meant to be in the Friday newspaper and we are hoping we can view it online. If we can I will leave a link on Saturday or Sunday blog post. It was a hot rest day so we spent most of it reading in the shade. The nights are cool and generally in the morning the grass is soaking wet as is the tent fly. We set out this morning with another change of plans. We have a vet appointment on Thursday at Parkes for Kouta to get some tablets for his allergies. The grass is green as here in the parks and the type of cooch they use Kouta doesn't like and he chews his feet to bits. 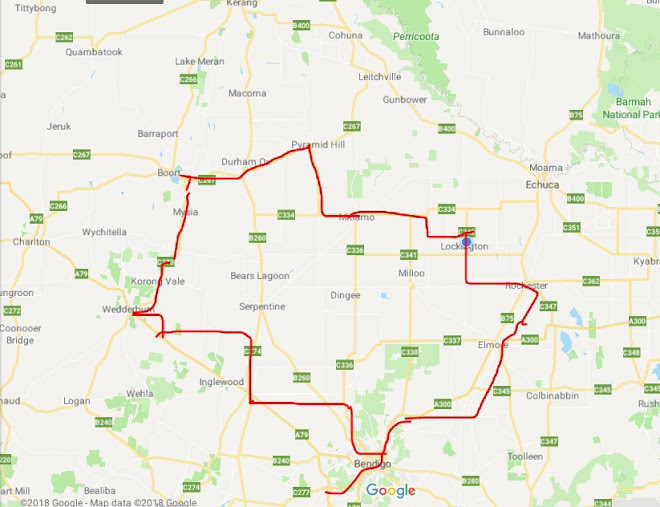 So in saying that we had intended to stop at Gooloogong which is 45km up the road but since they keep forecasting thunderstorms and rain we wanted to go a little further so the Thursday is short and sweet if it is too rain. 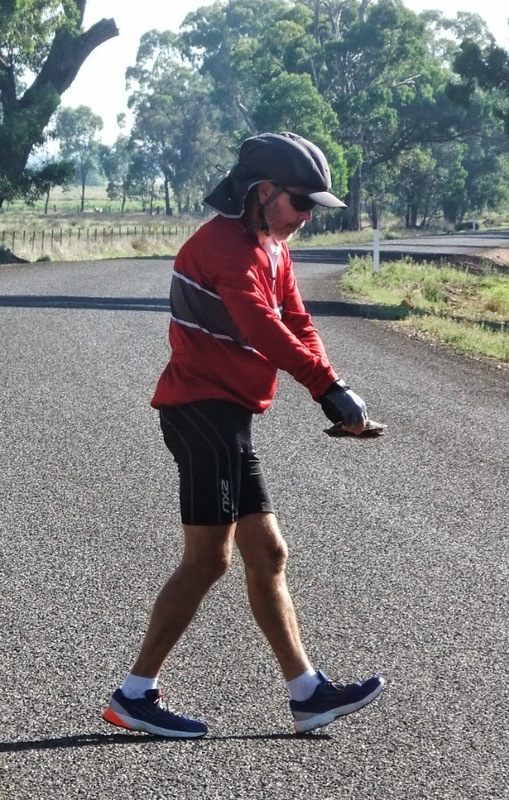 So we decided to make for Eugowra today which is 24km past Gooloogong. There is a gentle climb out of Grenfell and then a lovely downhill and you are in this sort of valley with hills either side. 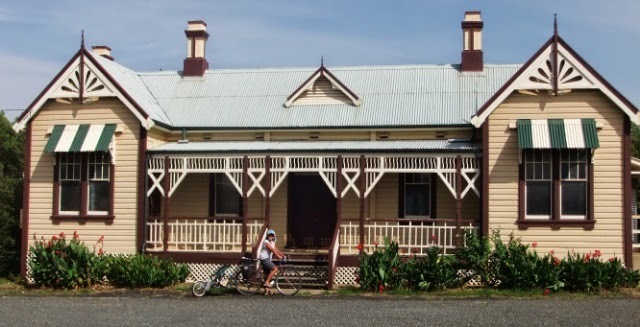 It is a flat ride (except one little hill before Gooloogong) so it was so picturesque riding along here. Neil cannot get over how lush everything looks ... it is like they haven't had a summer here at all, nothing looks like it has struggled in heat for a while! Once at Gooloongong we had a cuppa. This small town has a small rest area set aside to encourage tourists to stop. They have a small shower and toilets as well as 8 powered sites for vans and a few tent spots. We got there at lunch and there were only a few spots left! We took the Eugowra road and straight away we encounter roadworks ... they are building another bridge across the Lachlan river next to the old one. The traffic controller is not enthused that we have to go through the road works (I don't know why!) but we had to laugh at this one ... he states 'for you own safety take the Paytens bridge route to Eugowra .... it is 10km down the road towards Forbes' Neil and I are dumb struck with the suggestion ... yeah sure we'll go 10km out of our way and use the back roads that are probably not sealed and god knows how much extra we have to cycle, it may add an extra hour or 2 to our day and not too mention the extra kms ... yeah we have no problem with that ... it is like going around the block' LOL we said NO straight away and not to worry about us we encounter lots of roadworks and are perfectly alert to the machinery used! So off we go and we had to get of the bikes when crossing the bridge as some of the gaps between the planks were a bit big and might damage the wheels. If it wasn't for the humungous bolts used it may have been okay! 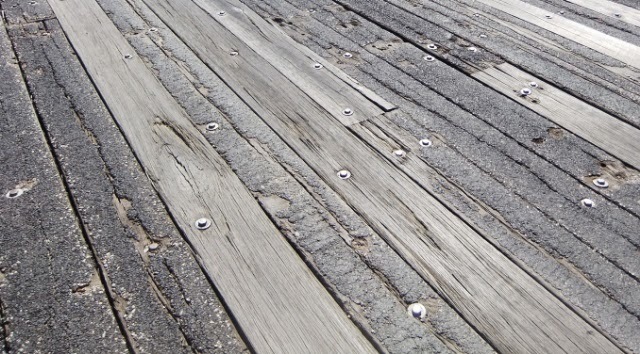 Why they added bitumen to a timber lined bridge I don't know. After the roadworks we were basically on our own. 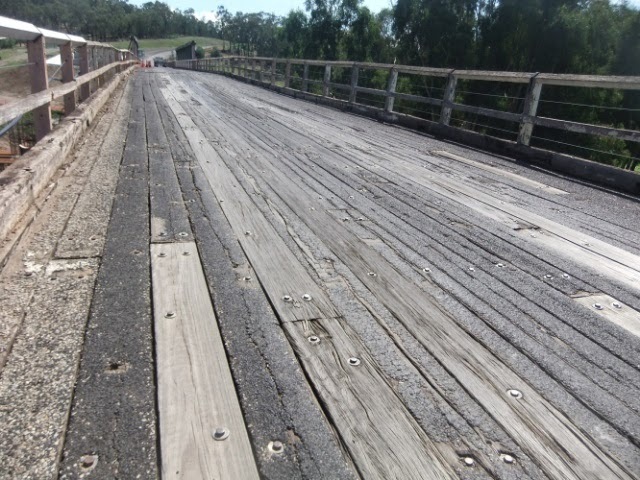 Believe it or not but the 2 roads we were on today were really good, especially the one between Grenfell and Gooloogong. 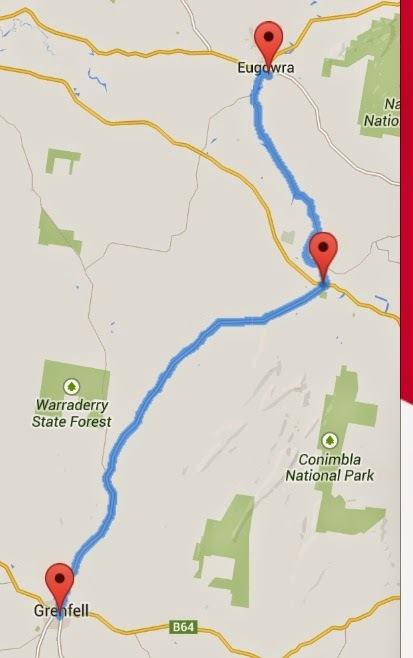 The one to Eugowra was okay until half way along and then deteriorated. 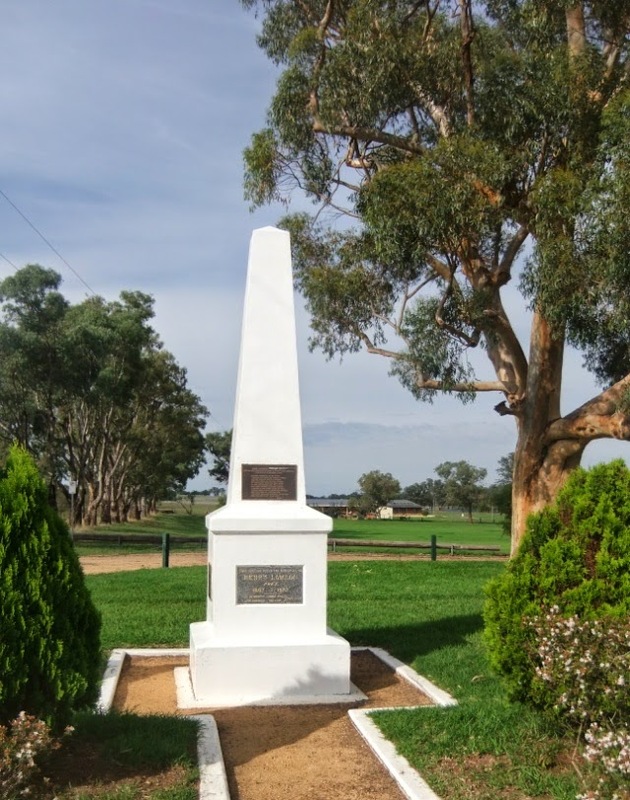 We get to Eugowra and we head towards the showgrounds. There are 3 other caravaners (1 group) also staying, but they are a far way from us. 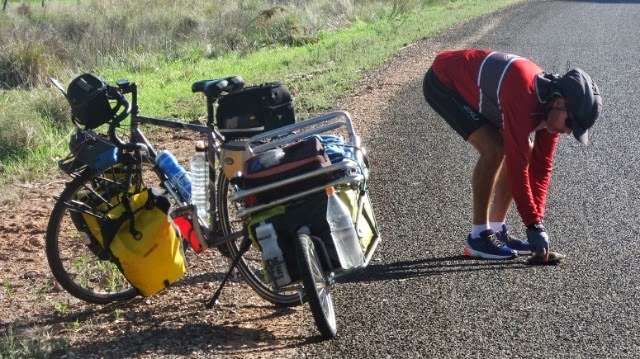 It is nice and quiet and a short 41km to Parkes tomorrow. Did you know that you can make cash by locking special areas of your blog / site? Simply open an account with AdscendMedia and embed their content locking plugin.